Wed., April 25, 2018, 5:38 p.m.
Is March about to lose some of its Madness? 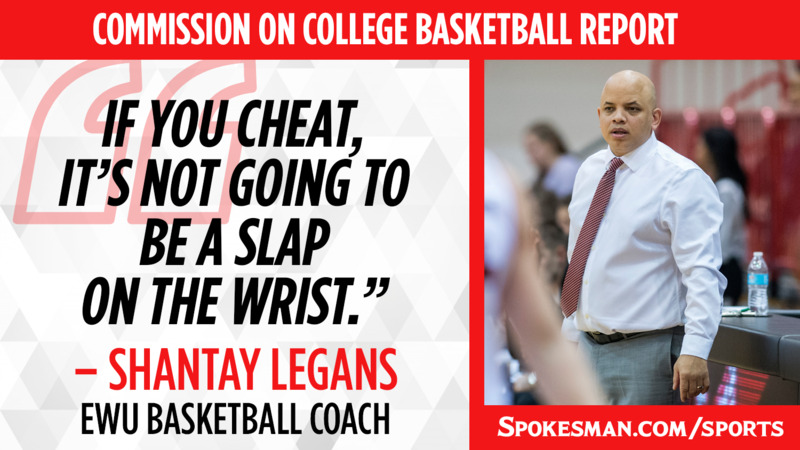 Eastern Washington basketball coach Shantay Legans agrees with most of the recommendations made Wednesday by the Commission on College Basketball. Curtailing one-and-dones, approving independent investigations of possible wrongdoing and mandating stiffer penalties for offenses “make sense,” Legans said Wednesday. However, Legans points out that that mid-major schools such as Eastern might find the upsets harder to come by if top-tier players aren’t allowed faster access to the NBA. As Legans sees it, “when you see all those upsets, it’s usually the mid-majors who have the upperclassmen, beating up on the underclassmen” on a big-time school whose roster has been depleted by early departures. Eastern has enjoyed a few of those upsets, notably at Indiana in 2014 and at Stanford this season. If one-and-dones are eliminated, power schools will retain top-level talent for several seasons. That will mean more chemistry for the elite programs and possibly fewer bracket-busters in March. Legans said he was pleased that the NCAA may get tougher on major offenses, including five-year postseason bans on programs and lifetime bans for coaches. “I like the fact that if you cheat, it’s not going to be a slap on the wrist,” Legans said. “(Currently) if you’re a head coach and you get fired for breaking the rules, another head coach will hire you because you have contacts,” Legans said. In those cases, a demoted coach may see a salary drop from perhaps $1.5 million down to maybe half as much as an assistant. That’s a big cut, but Legans feels that some coaches will still take that chance. The possibility of a lifetime ban “is going to weigh on people,” Legans said. Published: April 25, 2018, 5:38 p.m.